Doctor, I think I might have something quite serious. I must say you look fine, what are your symptoms? Well, I have this overwhelming feeling which just won’t go away. I can’t shake it off, it’s like a… sense of hope about the future. Hope? You’re sure it’s not just a case of temporary optimism? It seems much stronger than that. Or perhaps Pollyannitis, also known as ‘glass-half-full’ syndrome? I just have this enormous feeling of confidence in what human beings can achieve. It does sound worrying. How has this affected your life? Well, I’m always coming up with these practical ideas about how much better things could be. I seem to be constantly imagining all sorts of really sensible alternatives. And I keep saying irritating things like “yes we can” or “there must be another way”. Hmm, I can see how that might be very annoying. Doctor, what can I do? Is there a cure? Have you tried watching the news or reading the Daily Mail? Nothing seems to work. It’s really taken hold. I’m afraid this is quite a debilitating condition, but it may be possible to manage your symptoms and live a nearly normal life. In fact, some people take the rather odd view that this disorder can actually be seen in a positive way. 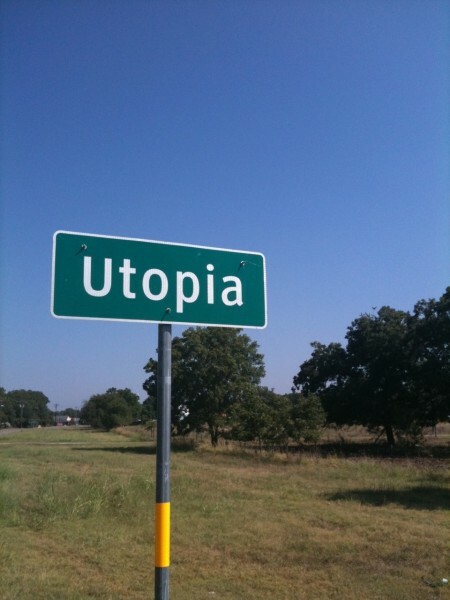 Yes, I think you’ve got a bad case of utopianism. And I’m afraid things can only get better. This entry was posted in Culture, Politics and tagged dystopia, future, utopia. Bookmark the permalink.